My 30 before 31 ‘bucket list’! My 30th Year Bucket list! On the run up to my 30th birthday last month, I was having what I described as a bit of a ‘crisis’, recalling the things I have done – or more to the point, the things that I haven’t. Don’t get me wrong, I’m very fortunate to work in a field that I adore, having met and married the man of my dreams and have two beautiful children, all in a relatively short space of time. But I’ve always had a nagging feeling as though I’ve ‘wasted’ my early twenties with a severe bout of depression. So with that in mind, I have decided to kick my 30’s off with a bucket list! Usually I save this blog for all things wedding dress related, but putting my list *out there* really commits me to doing it! A Bucket List usually involves a lot of world travel and expensive adventures, however with family life and minus the bulging bank account to fund such a list, I’m keeping mine smaller, with some travel, habits to pick up and new skills I’d like to learn. Forever on the to do list, this shall be the year! Somewhere we can take the little ones perhaps, we like to do everything together if we can. Well out of my comfort zone but I’ve always thought it would be so much fun to warble it out as I do in the kitchen. Time to grab the girls and have it out! I used to be quite the bookworm, not quite sure what happened there. So instead of trawling through Facebook for 20+ minutes a day I will better spend my time reading. My first read is The Great Gatsby – before I watch the film. …At 30mph at least! I did just about complete my CBT (Compulsory Bike Training for those who don’t know) last year, though quite embarrassingly barely rode about 15mph for the best part. Argghh still cringing at the memory of it..
More than anything in this life, I want to always have a close relationship with my sons and for them to genuinely enjoy our family life,no matter what age they are. As children are best lead by example I want to, and will see more of my own brothers,sisters and parents and build a few bridges along the way, while we still have time on our side. Just because..you know! Someone said to me once that you should start in your twenties, I scoffed at the idea then, but looking back on photos it probably would have been a good idea! An incredibly worthy cause and a long time on the to do list. I’d best get practising now, I dont think I could even run 1k at present! - I’ve actually surprised myself here – Last week I managed 5k on the treadmill! 45 minutes later and still feeling slightly sore today but woop! Aiming for 44 minutes tomorrow (or less pain!). Be it Bath, Rome, Prague or San Francisco, I want to go somewhere new and exciting. Yoga is known to promote peace, a deeper well being aswell as strengthening and toning. What’s not to love? I’m not actually sure I could do this, every blood test during pregnancy was a bit of a traumatic experience for this needle phobic wimp, but still..If I do give blood, it would be one of my biggest achievements. Most likely wall climbing, perhaps rock but either way I need that safety rope! I want to be able to edit my photos, and website etc. Luckily I have my Husband on hand to teach me the basics! …Or perhaps just a day what with the little ones! Either way some time with the girls does wonders – I spent my 30th Birthday with the girls at the Utopia spa at Alexander House Hotel, and it was the most relaxing day off from motherhood. A must do again! I’m a little ashamed – this will actually be quite hard. So all the more reason to go social media free!! I have two left feet but since the start of Strictly Come Dancing I’ve been itching to get on the dancefloor myself and have a go at Jive, I love everything about it – the music, the moves and the dresses. Perhaps my biggest ‘to do’ – sort all of my photos from the past 6 years into albums. This will actually be a huge achievement to get this done. A wimp for the cold means I’ve made it to 30 without ever doing snow angels. Next snowfall I’m making snow angels with my little monkey. I know he’ll love it. I somehow thought I’d be a natural at this but hell no, I can barely do a chain stitch at the moment. I’d like to be able to make a cape, blanket or something come the end of the year. I’ve too sweet a tooth for my own good – time to ditch the sugar…….soon. An old favourite hobby, and I’d like to get back to it this year. I have no desire to jump out of a plane whatsoever, but this just looks so much fun! A beautiful sound, If I can grasp the hang of a tune or two this year I’d be thrilled! Once upon a time I played the flute, fingers crossed there’s still some musical ability in me somewhere! …For myself! I have so many started projects but have a bad habit of pushing them aside in favour of someone else’s project, time for a better balance! I already run the Sewing Club (Of course!) in my eldest son’s reception class, and it’s a real pleasure to see a snippet of him blossoming in his learning environment. I’d like to give more of my time to his school in whichever way that I can. Not usually a gambler, but I had said I was going to buy 30 lottery tickets for my birthday – I didn’t, as my birthday didn’t fall on a lotto day but meh, why not?! I’ll do another day. You never know. …Routine, I’m sure I am still too young to be in a make up rut already – still turning to the same old eye make up routine on the rare occasion we go out, so it’s time to hit the make up counters! This kind of follows on really from my last point, but I have never dyed my hair! Not sure which way I’ll go but it’s changing at some point this year. Always good fun, saving this one for the summer. Perhaps we can rent a VW Campervan for the adventure! Since I started this list, my husband and I have decided that every year we’ll create list for the things we would (individually) like to do and achieve each year. I think a bucketlist for ‘us’ every year would be good fun too, as parenthood does tend to mean couplehood take a back seat much of the time. Ok, so the whole list is probably a bit private reeeeally, but for number 30, I shall list this later on in the year depending on the success..! But it has been an incredible year or so (15 months to be exact!) trading as Erika Langley Bridal, working apart from bridal shops and it has been quite a journey, it has been fantastic to give each individual bride their time and my undivided attention throughout their appointments rather than working to a time slot where sadly, during busy times faces would became a bit of a blur. I have met so many lovely brides, heard of some gorgeous weddings and unusual venues, and handled truly stunning wedding gowns, I have really enjoyed being able to take this time to get to know each bride, her wedding and achieving the perfect fit with their wedding dress alterations. And on those final fittings when the dress is complete and my job is done, I’ve walked away thrilled knowing that the bride is happy and confident in her gown ready for the big day. It is a genuine honour to play a big part in the background of someone’s wedding. But as for the future, we are expanding!……Our family that is!! With our second baby due early in May, my days of dress fitting and sewing are somewhat numbered So although I am taking things at a slower pace, this isn’t slowing me down too much in terms of ideas. I’m planning to focus more of my time creating bespoke dresses, starting with a dress for a gorgeous little girl’s naming ceremony later this Spring (not ours, we’re having another blue one!). Don’t get me wrong – I love the bridal alterations, but I’m in my element when I’m creating garments from scratch so I’m really looking forward to pushing this side of my business, before and after maternity leave! And then you speak to your mother, mother in law, sister, cousin, second cousin who all feel it’s either their ‘turn’ to be bridesmaids or they know someone who will be the prettiest little flower girl, ooh and there’s her sisters – you should have them both! Before you know it your two adult bridesmaids have become four plus a couple of little ones. Don’t let this happen to you! It is easy to get swept along in family politics and have those who ‘should’ be a bridesmaid. Put your foot down and have your girls who will be there no matter what, supporting you from beginning to end, through wedding fairs, seemingly endless dress/shoes/veil/jewellery shopping. Family don’t have an automatic right, go with your wants and those that will be there through the highs (finding the dress, the hen do etc.) to the lows (bridezilla moments, family politics, rowdy best men!). The right bridesmaids will want to share the journey with you and will be honest about those hit and miss ideas you conjure up, she will be (nearly) as excited as you when you’ve found that detail you’ve been hunting high and low for, and teary eyed when she sees just how beautiful you look in your wedding gown. On the day, they will be calm when you’re feeling vulnerable, strong when you wobble (It’s a highly emotional moment just before the ceremony begins, and one that stays with you for good), they will straighten your veil and dress prior to your big entrance and assemble any excitable young flower girls or page boys using bribery (sweets) if needed. Bridesmaids… Simply put, your role is to keep the bride happy, and grounded. -Do your best to be positive about the bridesmaids dress, not really a colour you’d choose for yourself? The bride is unlikely to dress you in something you look awful in – after all, she will be looking over her wedding photos for years to come. -Be interested in her wedding! Seen a great idea for the top table or something that is just SO her? Share it, even if she doesn’t use any of your ideas it will mean the world to her to know that you are thinking of her wedding, even when she isn’t around. -Be available! For shopping trips, hair/make up trials and wedding dress fittings, you have been chosen for your honesty, amongst other things! -If there is a Maid of Honour, her job is to throw the bride her ideal hen do! No one knows her better than you, (excluding the groom….perhaps!) No MoH? 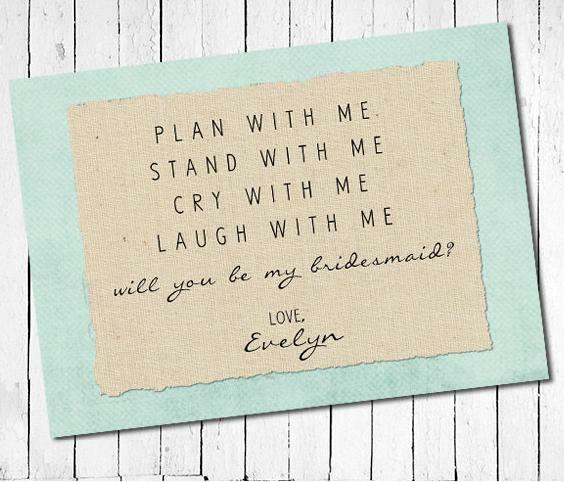 Bridesmaids, it is down to you! -Get on the dance floor! It is traditional for the Maid of Honour to take to the dance floor with the best man half way through the first dance. The job of being bridesmaids should be an honour, though at the same time I think it should feel completely natural to be such a big part of dearest friend’s wedding. It shouldn’t feel like a chore. If you have family, work or distance commitments that prevent you being as involved as you’d like, then the bride will have surely have realised before asking you. So just be the bridesmaid you can and enjoy! After exhibiting at Belles Bridal Boot Fair this weekend gone, I thought this would be a brilliant opportunity to discuss some of the options that are possible with a second hand, pass-me-down or vintage wedding dress. I’m feeling inspired as well after being in contact with a bride who hopes to use her grandmother’s wedding gown in some way, shape or form for her own wedding dress, I think this is a wonderful idea and is a touching sentiment, particularly if the family member is unable to be a part of your special day. A couple of years ago I met a lovely bride Denise (Above), who had found her second hand wedding dress in an Oxfam bridal shop, the dress originally was ball gown length with a substantial train and perhaps a size or two too big for her, and the delicate organza shoulder straps were frayed badly from the hanger. But by the end of the transformation you would never have believed it was the same dress, It was taken in and shortened to tea length (Just below the knee), shoulders were lifted and a fresh new organza belt made to which Denise added a gorgeous yellow flower.Bridal alterations changed this dress in its entirety, if you have looked on my gallery page you will know the dress I am talking about. Taking in or sizing down is generally easier than letting out, as there is no worry of stitch marks etc. And less limits, though I wouldn’t recommend sizing down more than a size or two, as you end up losing the ‘line’ of the dress and it can easily look out of proportion on you if your seamstress takes too much in a one point, such as all from the back or all from the sides. If you are well endowed in the chest area, then this gives you a little more leeway with the dress – as the bust area is usually the ‘give away’ if it is proportioned for a size 14 and you are a 10. If in doubt, speak to your wedding dressmaker. There is an enormous amount of options for bridal alterations and restyling, if you are in love with the top half of a dress, but imagine it to have a full 50’s skirt for example, or a fitted fish tail skirt,then there is absolutely no reason why your wedding dress can’t be restyled to suit you perfectly, matching fabric is not impossible but it can help to add a second layer such as lace or organza as the texture change almost ‘excuses’ any colour difference. If the wedding dress you have, or hope to purchase is perhaps just a size too small for you, then usually with most dresses it is possible to gain a size from it just by letting out the seams, though this alteration can generally only be done at the side seams and from bust to waist/hip, as the skirt of wedding dresses usually have less seam allowance to work with. Be mindful though that some fabrics such as Taffeta or Thai Silk can be difficult to rid of the stitch marks, and this is why most seamstresses would only recommend letting out at the side seams where it is less noticeable. Need an extra 2 sizes or more to get into your dream dress? Then a lace up back is the way forward to give you the extra room needed. I have done many a zip up to lace up conversion, and I don’t think anyone (other than those at the fittings!) are any the wiser of the dresses alteration. The best part of a lace up back, is the flexibility it gives you, not only in the run up to the wedding with any possible nervous weight loss or gain, but also throughout your wedding day – Me personally, I would be all in favour of loosening up my lace-up for a cracking wedding dinner, pudding and cake! 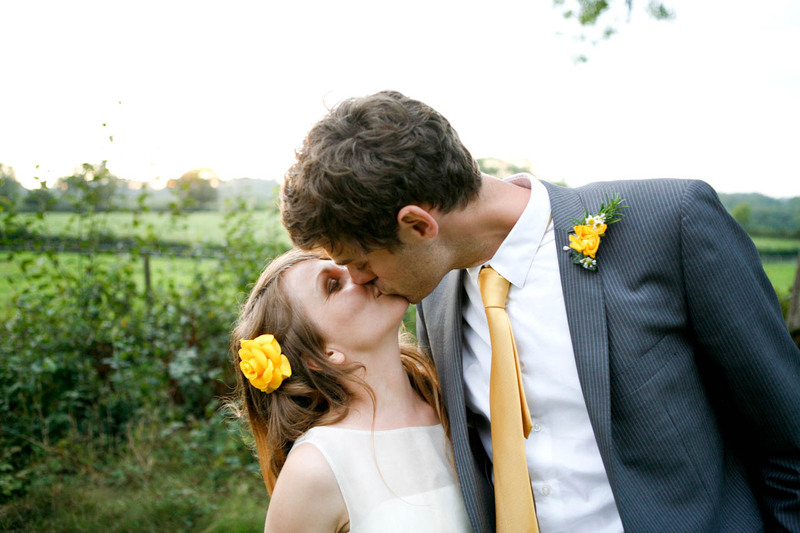 Photo by Denise’ Friend Robin – taken from Original blog post by Rock ‘n’ Roll bride. It’s snowing! Isn’t it gorgeous?! With the heavy snow outside I hope any brides that got married this weekend had purchased themselves a snuggly bolero or wrap to stave off the cold! There will be so many beautiful winter wedding photos..
Anyways, less of the snow talk. I have booked to exhibit at a couple of wedding fairs this Spring, the first of which is quite an unusual one, Belles Bridal Boot Fair! I think this is a fabulous idea and one that I think is going to be catching on like wild fire over the coming years. As even though we’ve all been plighted with not one, but two recessions that is absolutely no reason why you can’t still have the wedding of your dreams. At Belles Bridal Boot fair I will be on hand to discuss bridal alterations, underwear options or any other wedding dress worries you may have. I will also be offering 15% off of wedding dress alterations for fittings booked on the day! If you are planning on carrying out your own alterations but just need a fitting – then come and book yourself an at-home fitting with me for just £25. There will be a mingle of past brides looking to claw back some of their money by selling on their once loved wedding items, such as their dresses,crockery, stationary and bunting (and lots of it by the sounds of things!) to businesses at the ready to give you advice,ideas and quotations for your fabulously frugal wedding, such as the Sussex Cutting Garden who I had the pleasure of exhibiting with,at a vintage wedding fair last September. There is even going to live music from Rockin’ Mark Vis with an eclectic mix of music for you to enjoy whilst you pick up your gorgeous bridal bargains! For vintage and retro lovers, there is Belles Vintage Wedding Fair in Hove coming up on the 24th of March which I am delighted to be a part of also. Here I will have on display a couple of my vintage inspired wedding gowns for you to take a look at, a handmade bridesmaids dress or two and will of course be on hand for discussing your bridal or your bridesmaids dress alterations. Everything you could possibly need for a vintage,retro or festival style wedding will all be under one roof – from photographers, make up artists and entertainment to outside where you will find bell tents, Belle from Sussex Love Bug and possibly my favourite – an Ice cream and cup cake van! I will bring you more news on this closer to the time, but get those dates in your diary!